The Vienna based label TRUST is a very unique underground imprint speaking forthright to the avant-garde of the electro niche. 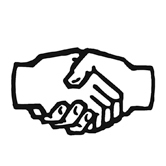 Indeed, their no nonsense releases are focused on the weird electronic music (related to Detroit sounds) and produced in that truthful futuristic way. Therefore some listeners feel confused by that unusual aesthetic however their release fusing abstract design & sophisticated tunes are really tasty breaking out of old electro patterns in order to push this type of music to its high-level; and all that with the help of finest & regular producers. 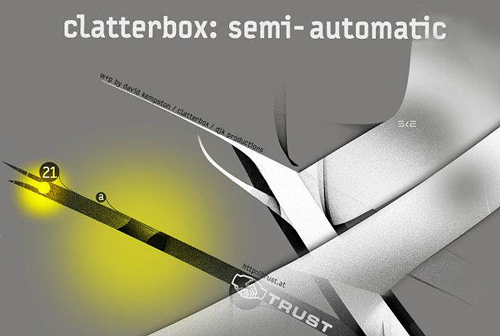 After the 20th release signed by STINGRAY313, it’s actually the UK Electro Break producer CLATTERBOX who returns on « TRUST Label with a new ep entitled Semi-Automatic ». This project contains 4 killer tracks, 2 original mixes and 2 remixes : the 1st produced by CREEPY AUTOGRAPH an alias of the talented JIMMY EDGAR & the 2nd remix is signed by LOK44 aka DANIEL POLIG (who runs Pomelo Records). Each tune of this ep makes sense dropping some hybrid vibes with a singular kind of groove and about CLATTERBOX, he seems to be in his best creative ability. Therefore the “Semi-Automatic” vinyl is simply another outstanding release coming from this label. Recommended!